Just a few random notes and thoughts today ladies! 1) To my fellow bloggers, laugh while your photographer is taking your pictures. It makes for a much more relaxing experience. And the whole thing really is funny, especially if you live in the suburbs. Passerby can't figure out what the hell you're doing. And sometimes I can't either. 2) It's been ridiculously hot. I know it's Fall somewhere, but definitely not where I live. It's been over 100 degrees, and although I'm a beach/Summer girl at heart, even this heatwave is too much to bear when it's almost October. 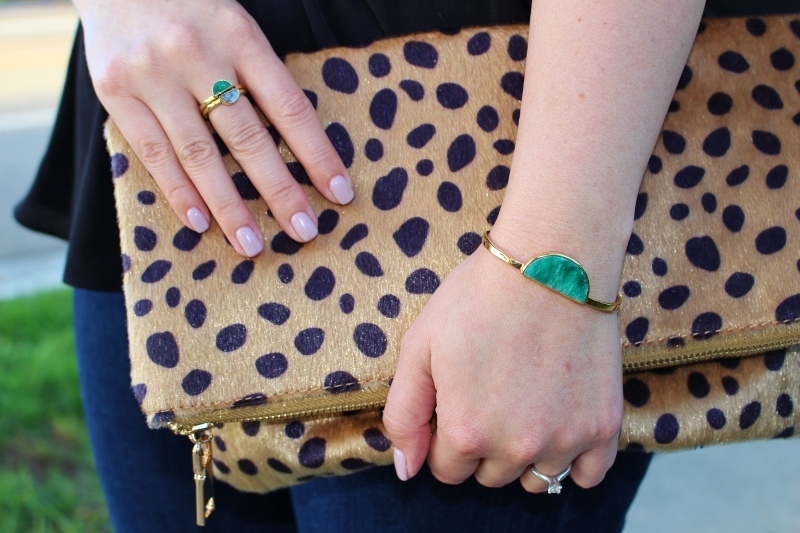 3) I am absolutely LOVING every single piece of jewelry I am wearing in this outfit. Emerald and black is one of my favorite combinations, as I think it looks so regal. Elizabeth knows how to do it right. 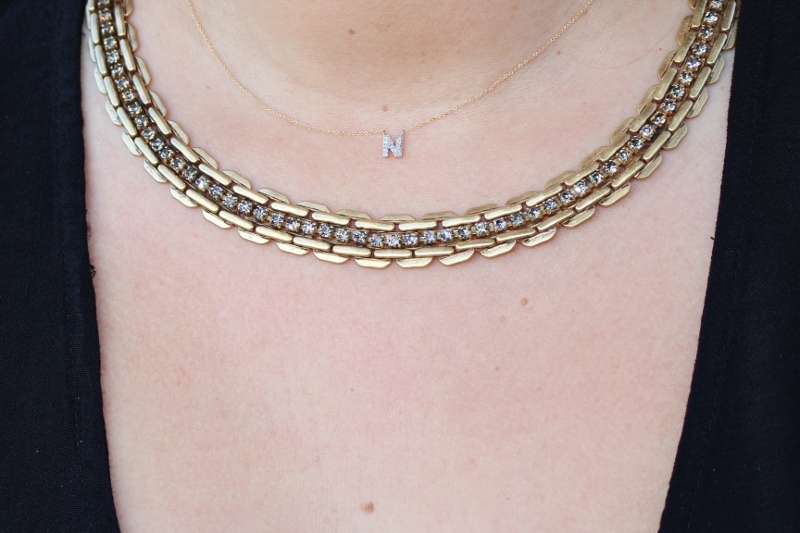 I also love my layered Stella & Dot necklaces, especially my diamond initial. I haven't taken it off, not even to sleep or shower. Not sure if that's the best idea, but it's so delicate that I barely notice it's around my neck. 4) Pumpkin spice lattes are overrated. I had one the other day and nearly spit it up. I just don't understand the obsession. I'll stick to my sparkling water. 5) Speaking of sparkling water, my sister-in-law thinks there is legit crack in Perrier and La Croix. She may be right, because since discovering them (and yes I'm late to the show), I cannot be without one firmly grasped in my hand. It says it's all natural. Can I get a La Croix sponsorship? Cuz I'd prefer that deal over anything right now. Contact me if interested La Croix PR. Let's make this happen. 6) I'm really into styling my outfits paying close attention to the details. I'm more and more drawn to very simple clothing, and then adding interest with accessories. 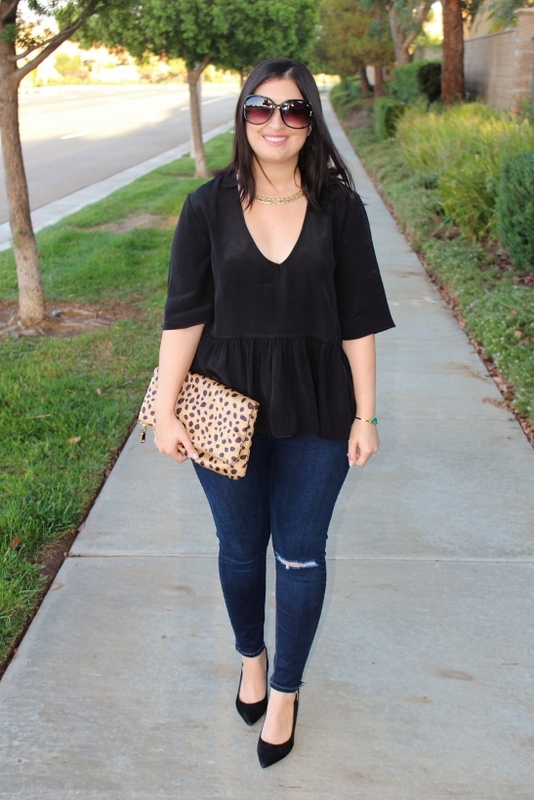 It's the easiest way to update your wardrobe without spending a fortune each season, and it truly shows your own personal style in a way that is unique to you. You may have the same pieces that I do, or the next person, but how you wear them creates a decidedly personal touch. Nobody can wear something exactly the way you do! That bag is everything, and I love your necklace! the details are everything, all so cute. Thank you ladies, this Clare V dupe is really nice. I normally save up for bags, but with a clutch I don't carry too often, I couldn't spend the money so I got this one at a fraction of the price. I'm with you on several points here! 1- I love summer too, but I don't love summer weather when it's now officially fall. And hotter than our usual summer weather than that! Thankfully it should get back to normal this weekend. 2- PSLs are overrrated. (Coffeemate Pumpkin Spice Creamer on the other hand...love that stuff. But I get to control how much flavor goes in!). 3- You know I am all about basic outfits plus individual accessories. LOVE your gorgeous Stella Dot necklaces!! I can see why you never want to take them off. I do love your accessories here, those rings are stunning! 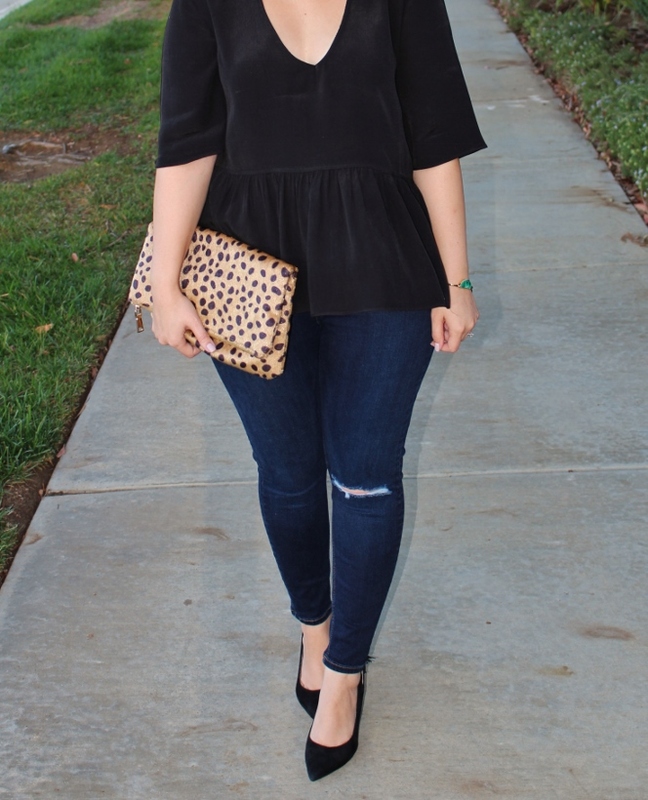 The simple black peplum and jeans is a great canvas to work with as well.